Leaf's Ichiro Suzuki Autographs Are Selling for How Much? Home » Baseball » Baseball Cards » Leaf’s Ichiro Suzuki Autographs Are Selling for How Much? Leaf’s Ichiro Suzuki Autographs Are Selling for How Much? Just two sets in to their exclusive autograph card deal with Ichiro Suzuki, Leaf is seeing tremendous returns. For those collectors lucky enough to pull one of the baseball cards, they should see some great returns too should they decide to sell. The first cards, which were inserted in 2011 Leaf Metal Draft Baseball, also have jumbo patch pieces. They were made as a last-second replacement after the original shipment of autographs were damaged in transit. Leaf is already redeeming the autographed patch cards with a handful having landed on eBay already. With 2011 Leaf Valiant Draft Baseball's release this week, the second bundle of cards are starting to show up and still drawing strong, despite the lack of patch. With six Leaf Metal Draft Ichiro autographs sold on eBay, the average selling price was more than $800. That being said, after the first couple of cards set a high bar, they seem to be settling in the $800 range. Several others are currently listed but at ridiculously high prices. 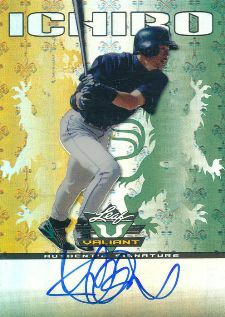 At this point, only a single Leaf Valiant Draft autograph of the Japanese hit machine has sold online, going for $750. This was a base green version, so there's no telling where the more limited parallels will end up. Falling one in three cases, expect more of the Valiant autographs to start popping up shortly as more collectors get their boxes and start breaking them. These numbers show just how much demand there is for Ichiro's signature. Prior to Leaf's deal, the last widespread autographs from the outfielder were released back in 2004, meaning the majority of his signatures have settled in personal collections. As an international icon, Ichiro is also one of the most popular baseball players on the planet. One might even argue he's one of the world's most popular athletes, taking all sports into account. It's also interesting to see that Leaf's lack of licensing hasn't dampened interest. The design elements have masked this nicely, creating an attractive look. But the fact is that neither MLB or the MLBPA have approved these cards, yet collectors don't seem to care. Is this another sign that the times are changing and that full licensing isn't as important as it once was? Ichiro Suzuki 2011 Leaf Metal Draft Purple Prismatic Auto 12 25 BGS 10 Pristine! I pulled the 1/1 red of Ichiro. It is for sale.